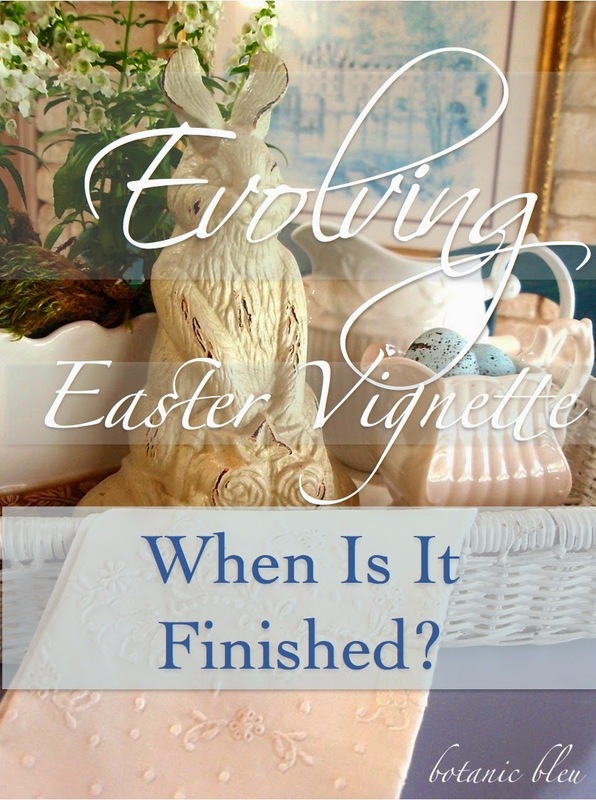 Botanic Bleu: Evolving Easter Vignette - When Is It Finished? where do you begin, and where do you stop? When is the vignette the final version? Finishing a centerpiece is often the hardest part. turned into a purple one as seen in The Color of Easter. because white has been enticing me, calling to me as a siren. However, blue, beloved bleu, continues also to call to me. many beautiful blue things have found a home with me. trust and loyalty are at the top of the list. and who were not loyal. but I also love bleu for its symbolism. a blue and white grouping took the place of the purple setting on the island. 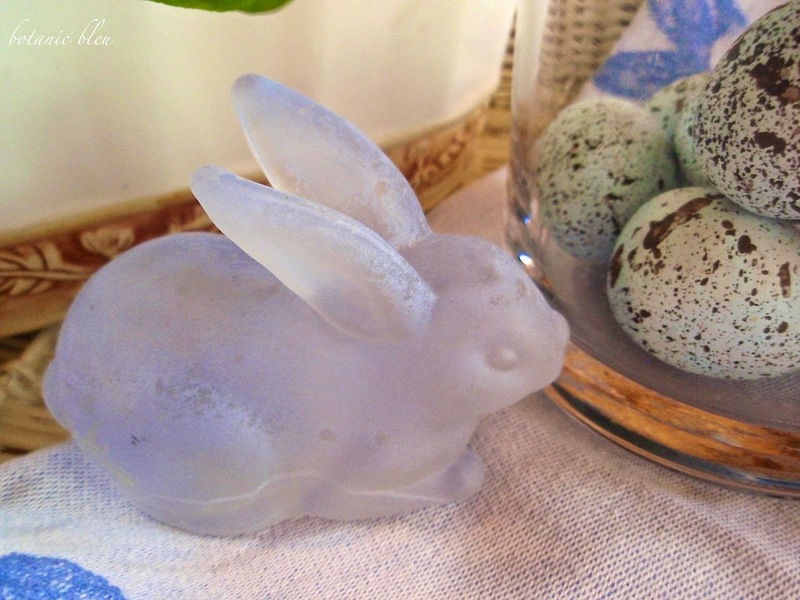 and a tiny little frosty blue bunny. moving from spot to spot. an all-white grouping kept nagging at me. to do something about the reason for the nagging. 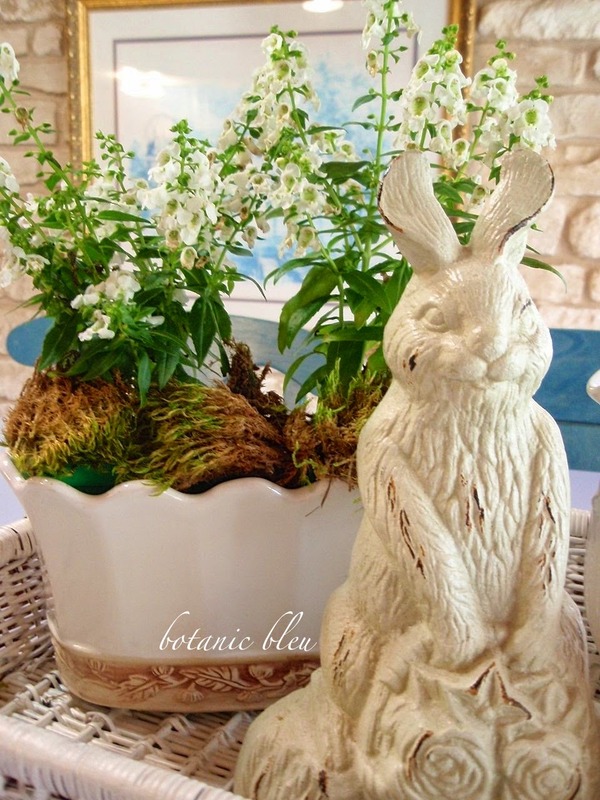 a smiling white iron doorstop bunny holding a basket. 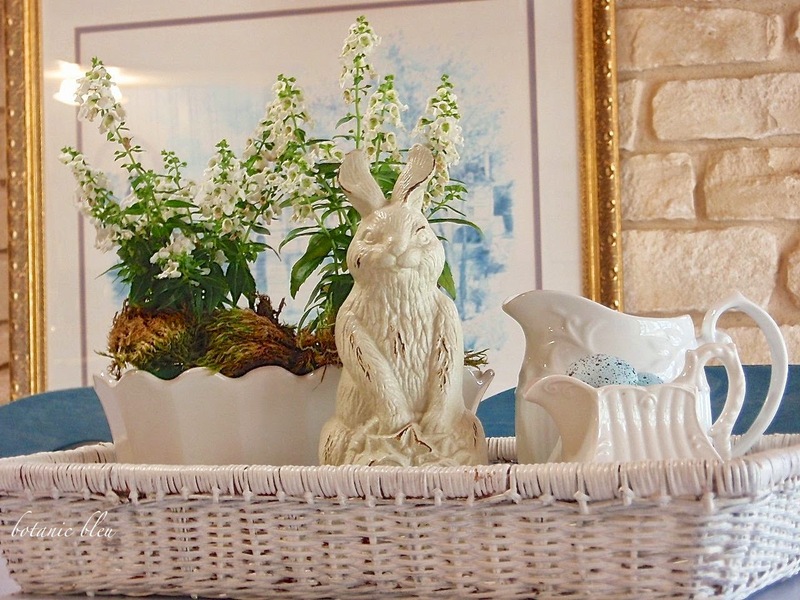 The basket holds flowers, not eggs. add height and a touch of nature. A little touch of bleu speckled eggs just had to fill the creamer. A white cotton hand towel with embroidery rounds out the white grouping. 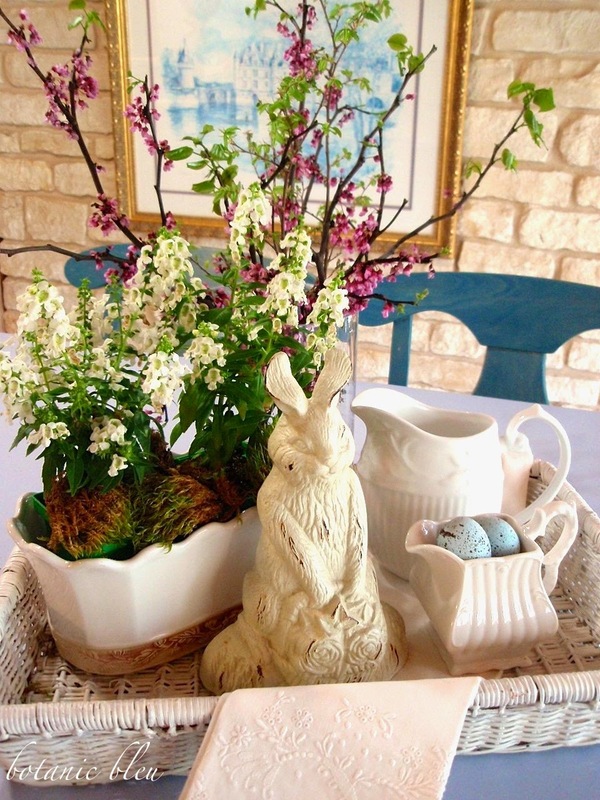 Five items inside the white wicker basket. So, is it finished now? The redbud branches still have a few days of beauty left in them. when the redbud blooms die. Then, it will be finished. How did I know when to stop adding items to the grouping? The question is answered by what went into the grouping. I knew the grouping was completed. of how to create vignettes. Good morning dear Judith! I too asked this question this glorious week, as I stayed home on Spring Break. I played and painted furniture, arranged and rearranged and had so much fun. I finally decided on a very simple design given that we don't entertain on Easter and that it's only ONE DAY....though bunnies are a spring icon and I think I can at least leave mine up all of April. 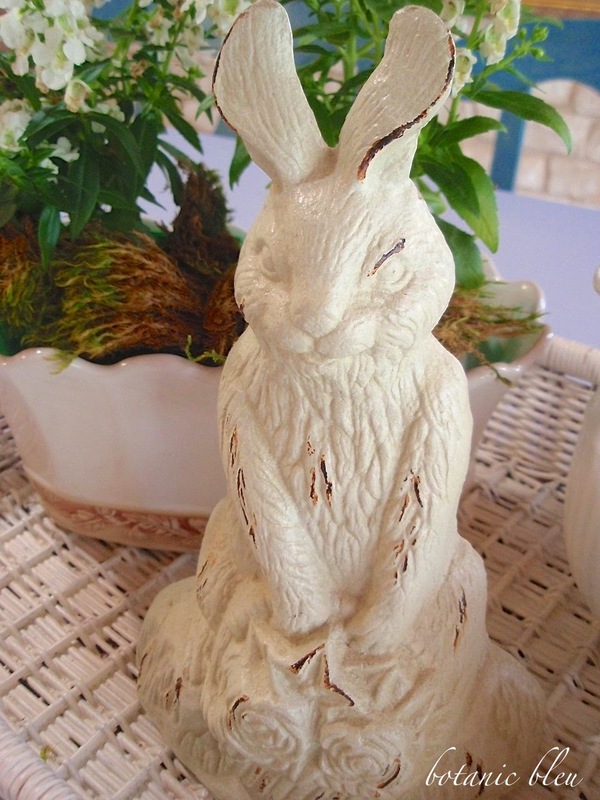 I have one vintage white chippy rabbit on my gray entrance table with two others sitting on silver trays with moss. I'm happy with that. Your blues are on my mind too; I want to go out and get a bouquet of grape hyacinth for BLUE is such a soothing color that will go beautiful with my white and gray décor! Sending you bunny kisses and joyous Easter wishes Judith. Like you I don't ever think I am ever done tweaking seasonal vignettes. I really enjoyed reading your design thoughts on adding components to the vignette and yes textures, color and height is so very important. Love your White with touches of Bleu. 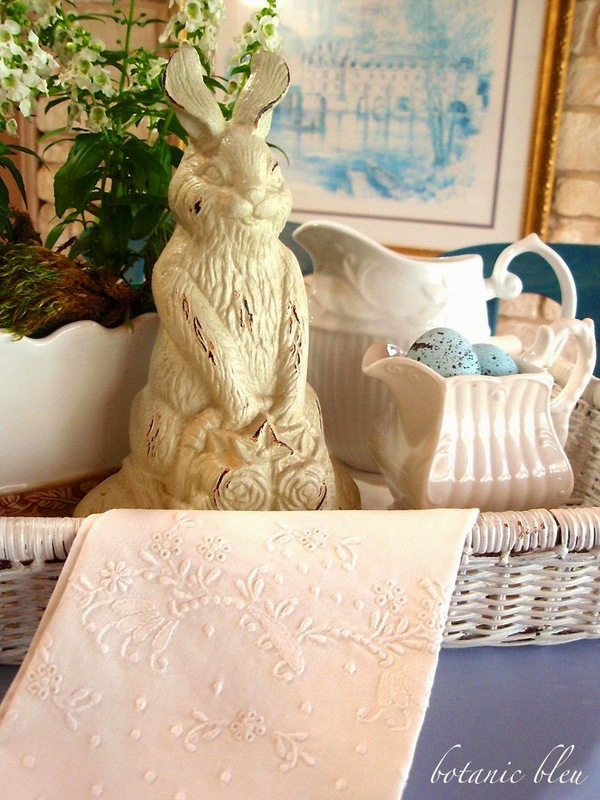 You have the most adorable bunny collection and I am in awe of all your linens. BTW in our kitchen redo I am adding glorious touches of Bleu. Is it YOU that forwards those calls to me? I may be a but late, but I always answer the call! 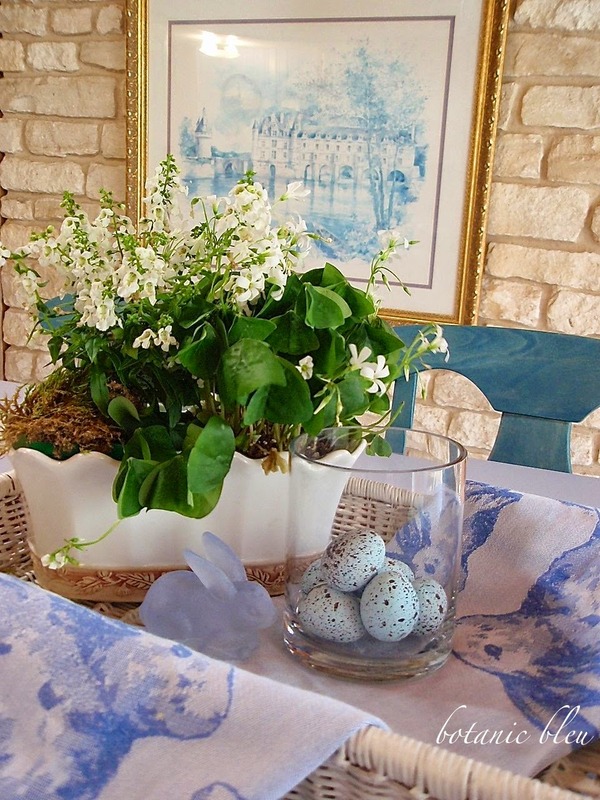 Your vignettes are beautiful styled with any color. However I am never disappointed when you transition back to bleu! Judith, it's the evolving vignettes that keep us happy. Like you, I like to tweak and change things a bit. I've been doing just that this evening. I found a new piece at Round Top, a bamboo bookcase. It was delivered this morning, so I've been adding things to the shelves. 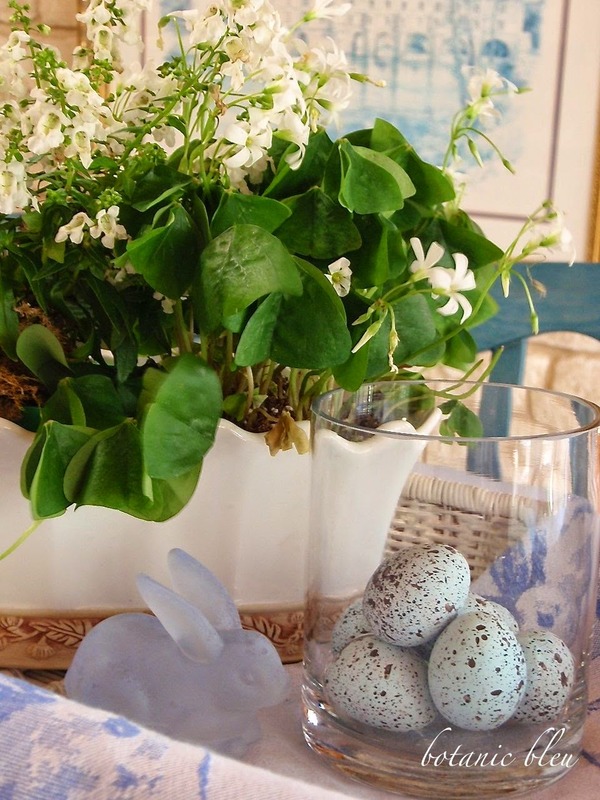 I'm giving it a bit of an Easter theme for the first round, adding a few bunnies and a few eggs within the vignettes. That will give me a good excuse to play again very soon, creating some new vignettes. Each rendition of your kitchen island vignette is charming, but the bleu version is my favorite. 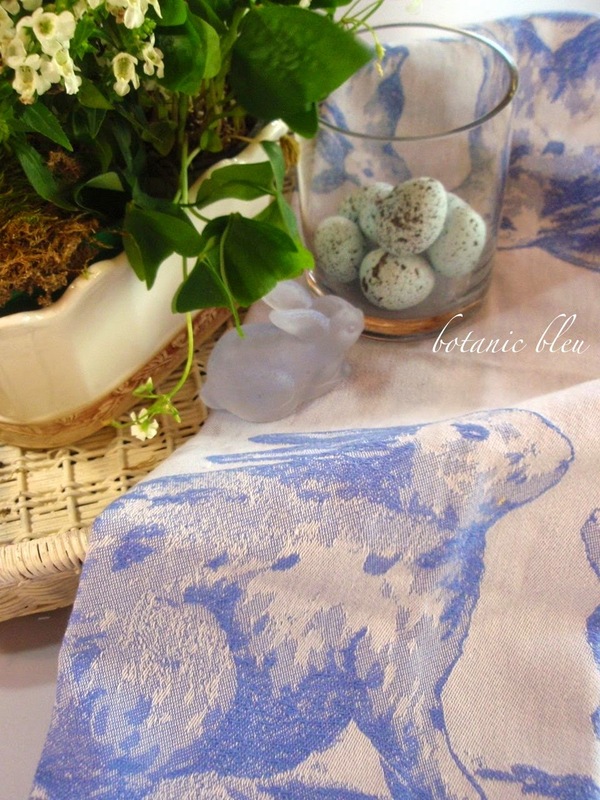 The darling kitchen towel, the GW bunny, and the speckled eggs are the perfect touch and shades of blue. You always create the most beautiful vignettes, Judith! I didn't know there were 6 elements involved! I will need to think about these the next time I wish to group things together. Love the blue and white! It is ever present in my home, too, along with yellow. It's sunshine and blue skies all the way! Your vignette is gorgeous! Have a blessed Easter! I love this and I like the way you think - logically - as to how to arrange something or to know when it is finished. My stopping point is when my husband walks by and says, "how much more stuff are you going to add on that tray?" At that point, I'm done. I will, however, sit for an hour obsessing over the placement of one egg. Have a wonderful Easter Judith! HUGS!!! Such a beautiful vignette ... 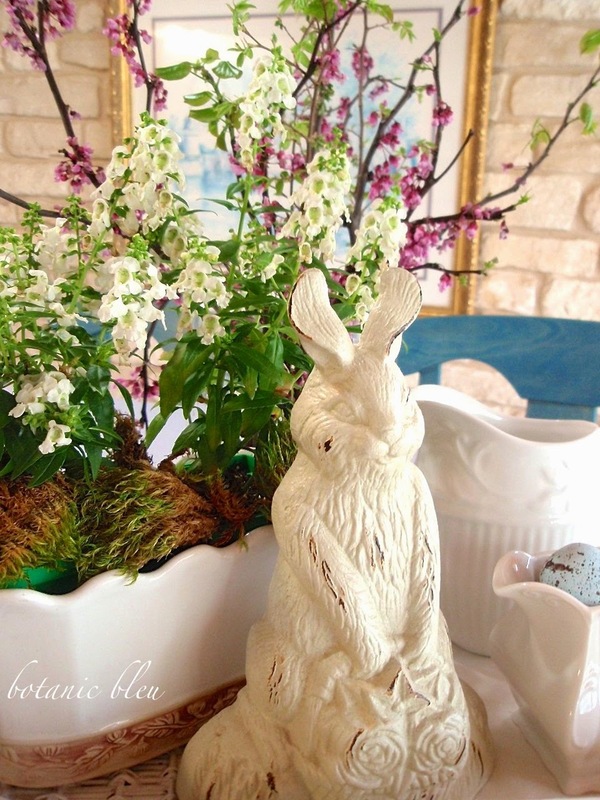 I love your smiling bunny and the pops of Spring color you have around him! Happy Spring!